Before you can come up with easy healthy recipes, you must understand a little about nutrition which our bodies require. I am certainly not a health care professional but I can share with you what I have learned in my many years of dieting and cooking for members of my family who have been plagued with health problems; overweight, diabetes, cancer and heart problems. There is an old saying, “We are what we eat”. After all the years since I first heard this saying, I believe it more now than ever before. By eating the right foods helps us achieve the goals of radiant health, resistance to disease, children’s growth and prolonged youth and energy for adults. The busy homemaker or cook needs to be able to come up with easy healthy recipes when feeding the family, friends and his or herself. Although it would be helpful if possible, it is not necessary to thoroughly understand all the intricacies of the vitamins and minerals. It is helpful and even interesting to know some of the basics about the scientific side of nutrition when we sit down to eat a meal. It helps us to understand why our children have a poor appetite, why some of us have problems with our teeth, why we are fatigue or why we have weight problems. Our bodies have the ability to select substances from our food to regulate the countless processes or functions which our bodies need to do. What seem to be easy healthy recipes for some of us may not be healthy recipes for others. With all the medical problems today, even some “healthy” things are not so to people who have allergies to them; case in point is “celiac disease.” Such recipes for these and the many other problems must be under your doctor’s guidance. USDA website offers much information as a guide for you. When I was very young, I learned balancing a meal with the food pyramid; I still believe that balancing is still the key to good health. I saw by my own experience of cooking easy healthy recipes for my sister and other family members with health problems that some foods have a good impact on these problems and some have a negative effect. The one thing that I have come to realize is that in order for us to take in all the nutrients that our bodies need there is no room left in the diet for extras; what I call “junk foods” with no nutrition. Two things that I try to totally eliminate from my diet are refined white flour and refined sugar; it is hard because I love desserts above everything else. As we read the statistics on obesity in this country, we can see that this has become a major problem; most of us eat too much. For easy healthy recipes for a meal three to four ounces of meat or other protein is enough for most people. Whole grain rice and cereal are good choices offering more fiber to the diet; this is also true of eating pasta and breads made with whole grain flour. Very little fat is needed and too much is harmful. Vegetables are a necessity; this reminds me of the study showing many children do not even know what vegetables are. That is bad! I like rounding the easy healthy recipes for balanced meals with a little unsweetened fruit; it takes away the sugar craving by the natural sugar and fruit is healthy for the diet. Many turkey recipes can also be healthy recipes. The meat of this bird is low in fat, but is a high protein food thus making it a product for healthy dishes. To cook turkey for health, of course you must be careful adding other ingredients like butter and creams. Berries and vegetables are wonderful additions when planning healthy recipes. This recipe is delicious and makes a very pretty presentation. Cut all asparagus stalks to the same length; remove woody ends (about 1 inch) from ends. Place asparagus in steamer over simmering water until tender crisp. (Better to have underdone). Combine and mix together vinegar, mustard, salt and pepper; whisk in oil. Add raspberries to oil mixture and mash slightly. 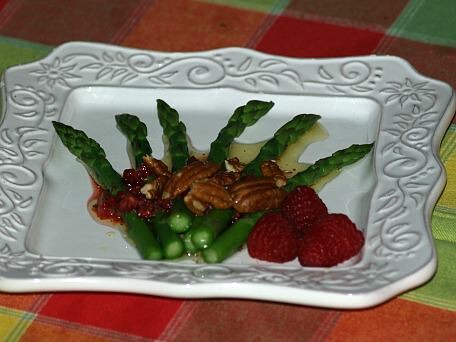 To serve spoon oil mixture over steamed asparagus on individual serving plates. Top asparagus with a sprinkle of toasted pecans. Grind or mince fine the onion and garlic; mix in a bowl with the ground turkey. Add the crumbs, sage, salt and pepper; mix well. Form into small patties and brown in the olive oil. Coat turkey with flour and brown on both sides (1-2 minutes on each side) in the hot olive oil. Remove the cutlets from the skillet when cooked to a platter. Put the tomatoes, garlic, cilantro, and pepper flakes in the skillet; Season with salt and pepper if needed to taste. When hot, serve spooned over turkey cutlets. I made up this easy healthy recipe because I love eggplant. Dice the vegetables very fine if you want a dip or spread; use it with cut pitas or your favorite chips. If you want it in a salad dice the vegetables and serve in small bowls. Either way it is very good and flavorful. Prick eggplants with fork and bake at 350F degrees until tender about 1 hour; peel, open and take out seeds. Chop all vegetables to desired size; combine and mix all ingredients. Fish is one of the best choices for easy healthy recipes; it is low in fat and quick to cook. Cut onions in wedges, cut tomatoes in quarters and remove seeds, cut escarole in 1 inch slices. Cook onions in hot butter until tender; stir in tomatoes. Stir in escarole and cook until it wilts; stir in lemon juice lemon juice and pepper. Spoon escarole mixture in 8 X 12 inch casserole dish; salt red snapper and arrange on top. Pour wine over the top and sprinkle with thyme leaves. Bake uncovered 20 minutes or until fish becomes flaky. Place chops on grill 4 inches from medium hot coals; cook 60 to 70 minutes turning every 15 minutes. Combine remaining ingredients and brush on chops last half of cooking time. Top with remaining sauce to serve.